The only real stumble in Shakespeare Theatre Company's gleeful dancing on the line production of The Comedy of Errors is a prolonged, easily eight full seconds, flatulatory audio effect. The fart, which would be a juvenile epic poem if delivered by an actor bodily, is merely deflating when played on stereo. It's a pity the outburst doesn't work—the idea is in the text and the show's a riot. But the overstep is in the execution. The first scene of Act III is the dramatic peak of the titular errors, the starkest moment of transposition among the two sets of twins creating the plot of this early Shakespeare play. Antipholus of Ephesus (Christian Conn) and his bondsman Dromio (Carter Gill) find themselves locked out of his house. Within are their yet-undiscovered identical brothers, by poor fortune separated at birth and poorer fortune, or foolishness, possessing those same names. There, Antipholus of Syracuse (Gregory Wooddell) is in medias res with Adriana (Veanne Cox chewing scenery), A of E's wife with unmet needs, and the Syracusian Dromio (an excellent Carson Elrod) is posted at the door, playing wingman, porter, and bouncer. So, when Antipholus of Ephesus, threatening to "break ope the gate," is rebuffed by the other Dromio with threats of a broken skull, Dromio of Ephesus reminds us of more and gassier things that can be broken: "A man may break a word with you, sir, and words are but wind, / Ay, and break it in your face, so he break it not behind." Then says his twin within, "It seems thou want'st breaking: out upon / thee, hind!" There's plenty of breaking, wind, and hindness here to leave little to the imagination: The fart was the right idea, just ill done. That kind of wordplay with association and assonance, so typical of Shakespeare and just as good in this as in any of his other works, might lead us to wonder if this Comedy of Errors is actually a comedy of eros. 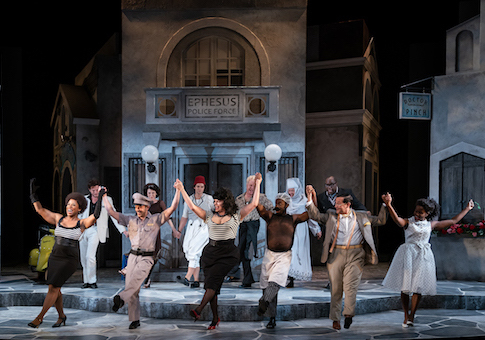 There's the easy and typical ways to see that, which this Alan Paul-directed production leans on—the courtesan and bawdy humor of the text giving permission to create an aesthetic setting somewhere between A Funny Thing Happened on the Way to the Forum and a campier, heavy on the drag, Mamma Mia!-esque 20th-century Mediterranean. Paul cites Zorba the Greek and '60s comedy films in his program notes. But there's also the mature heart of the play, where Shakespeare wants us to think of eros in more Platonic terms, betraying his lifelong fascination with desire as a motive force: Antipholus of Syracuse seeks his lost brother and Adriana seeks the return of an emotionally lost husband. They are both drawn from themselves to another, souls seeking rest next to the soul of that other. The rest of the characters play supporting and harmonizing roles to these two wants, and all orbit their pole, the orienting object of the plot, the reactive and somewhat thinly sketched Antipholus of Ephesus. Shakespeare sets up Adriana's sister, Luciana (Folami Williams giving the only restrained main performance in the farce), as a surface on which we can examine these two drops of water in search of an Antipholus. Luciana shows us desire without an object, in love with the idea of a husband, but with no husband found yet. As foil to Adriana, she becomes the avatar of the play's most controversial, by present standards, thoughts on human nature. While Adriana seems to find her activity—her hunting for her husband—compounds her problems and exacerbates the insecurity of their union, Luciana waits. And lo and behold, for the virtuous and idealistic woman, after the suitable amount of Shakespearean mayhem, waiting works: A husband appears in Antipholus of Syracuse, who in the suitably happy conclusion of this comedy finds a looked-for brother and an unlooked-for wife. I was left reminded of the excellent 2016 Becca Rothfeld essay in the Hedgehog Review, "Ladies in Waiting." The subtleties of all this, and the other musings on identity Shakespeare includes even in this most slapstick of plays, are a bit overshadowed by all the theatrical spectacle on display at the Lansburgh Theatre. But The Comedy of Errors had all the amusement one could ask for, and more. It's a very, very funny show. The addition of original song and dance routines interspersed throughout ups the entertainment value, even if they're inconsistent. The Matt Bauman-led tap sequence by the Ephesian police is a particularly fun time. And no matter how screwball the show got, after the eight-second flatulent explosion, it worked.